Halloween weekend sees a modest slate of new wide release films, with one themed for weekend scares, and another seeking Oscar glory. If we're in fall, it must be time for the Oscar-seeking biopics. Ray, the story of blind singer Ray Charles, is the highest-profile of these so far this year, opening this weekend at 2,006 venues. You can pencil in Jamie Foxx on your nomination ballot right now, as his title performance has received almost unanimous praise. If the fact that Foxx is receiving this kind of acclaim surprises you, then you haven't been paying attention, as he's been displaying his dramatic chops since Any Given Sunday. His reputation has been hampered by some shaky comedies he's been involved with, but this role should break that stigma for him permanently. The story of Charles, from his going blind at the age of seven, to his conquering of multiple musical genres, with a pitstop through heroin addiction, is a natural for this big screen treatment, and the beloved nature of Charles should help immensely. When it comes to biopics, though, it's no guarantee that the popularity or fame of the real life figure will translate into box office success. Compare and contrast the $175 million of A Beautiful Mind with the $62 million of Ali, even though Muhammad Ali is one of the most well-known sports figures in history. This film will probably start relatively slow, but maintain legs throughout the fall. It won't have to do much to pass the box office test for Foxx's Oscar nomination, but other nominations will be riding on a successful box office performance. About a $12 million start might be enough to help that along, provided the expected positive word-of-mouth shows up. In the horror category, Saw appears to be the kind of film that's out to separate real fans of the macabre and disturbing from the poseurs just out for a spook or two. 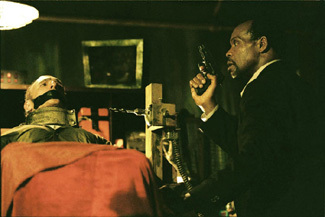 Perhaps trying to out-Se7en Se7en, Saw has as its premise a killer who sets up his victims to accidentally kill themselves in gruesome and twisted ways. It's clearly not a film for the faint of heart. The cast list won't blow off any marquees, with Cary Elwes and Danny Glover as the biggest names in the bunch. However the film has been receiving buzz from horror aficionados -- though that's a Catch-22, as anyone who suffered through Cabin Fever last year found out. Another quasi-independent horror film, the $8.6 million of Cabin Fever's debut on about 2,000 screens is a pretty good ballpark figure for Saw's opening weekend, though it is attempting to go a bit better with a little wider opening and weekend appropriateness. Despite what seems like a natural tie-in, Halloween is not a great weekend for horror films, or at least doesn't lend itself to a boost for them. Trick-or-treaters obviously don't make up much of the audience for the generally R-rated films, and Halloween night for the older crowd is eaten up by parties. With Halloween falling on a Sunday this year, the effect will be spread across the entire weekend, as seen in 1999 when the calendar had a similar pattern. Look for an opening weekend of about $10 million, and a quick turnaround to the video shelf, where it should be a huge hit. The horror dollars will still belong to The Grudge, though, which opened to a very impressive $39 million last weekend. The Japanese-themed spookfest balanced nicely between being scary enough and not being too scary (it is, after all, PG-13). However, when horror films do manage to hit this big off the bat, the prospect for legs is usually pretty poor (The Sixth Sense being the notable exception here). With the non-factor that Halloween is at the box office already noted, I predict a relatively steep drop-off to the $20-22 million range. It should still win the weekend handily, and looks to be headed towards a final box office total of about $130-150 million. Shark Tale remains the sole family option in wide release, and is very close to breaking the $150 million milestone. In the constant game of bragging rights between DreamWorks and Pixar animation, this round goes to Pixar for two reasons; not only does its box office pale in comparison to Finding Nemo, but the fall animation champ should clearly now be the upcoming The Incredibles. We're still yet to see a miss in the CGI animation genre, however. Random box office note: If you said you predicted Napoleon Dynamite would out-gross Sky Captain and the World of Tomorrow, I would have to call you a filthy liar. The major limited release film opening this weekend is Birth, which has a plot that many might consider obscene or downright insane. Ten years after losing her husband, Nicole Kidman stumbles onto someone who claims to be her husband, with knowledge that he shouldn't be able to have any other way... except that he's a ten-year-old boy. As he continues to defy skepticism about how he could have this knowledge, Kidman finds herself improbably falling in love with him... at which point most of the audience gets up and walks out for fear of being put on several watch lists. While I reserve judgment on most concepts, this one seems to be the kind that has no choice but to descend into unintentional farce. Curiosity and name recognition might bring this one to about $3 million on its 550 venues, I don't see Birth making much impact beyond opening weekend.